The Seeley G. Mudd Center houses the Mary Church Terrell Main Library, the central library facility for Oberlin College and the primary location for materials in the humanities and social sciences. Mudd Center or Mudd, as the building is often called, also houses the main library’s interdisciplinary and or general interest works, as well as the mathematics and computer science collections. 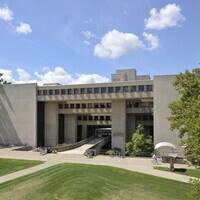 In addition, administrative and most technical services staff for the entire library system are located in Mudd Center, as is the Robert S. Lemle ’75 and Roni Kohen-Lemle ’76 Academic Commons and the Writing Center, both on the main level.